Please note: these ebook files are very large. Users downloading to mobile devices, or with an internet connection with limited bandwidth, should view and download chapters individually using the dropdown menu below. 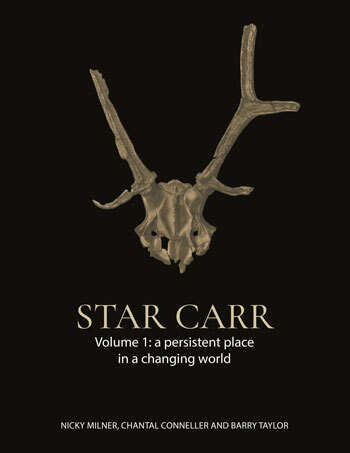 This first volume of Star Carr provides an interpretation of the Star Carr site, one of the most important Mesolithic sites in Europe. Discovered in the late 1940s by John Moore and then excavated by Grahame Clark from 1949-1951, the site is famous in the archaeological world for its wealth of rare organic remains, including significant wooden artefacts. However, since the original excavations there has been much debate about how the site was used: was it a residential base camp, a hunting camp or even a ritual site? The 2003-2015 excavations directed by Conneller, Milner and Taylor aimed to answer these questions. In use for around 800 years, the Star Carr site is much larger and more complex than ever imagined. The excavations show that Mesolithic groups were highly invested in this place and continued to occupy the site despite changes in climate. The findings include the oldest evidence for ‘houses’ in Britain, large wooden platforms along the edge of the lake, antler headdresses and a unique, engraved shale pendant which represents the earliest form of Mesolithic art in Britain. There is evidence for activity areas, such as crafts and tool repair associated with structures, an axe factory, as well as a number of caches. New finds of antler frontlets have increased our understanding of the diversity of human interactions with animals. Despite the degradation, these excavations have provided a new understanding of life in the Early Mesolithic, particularly enhancing our understanding of how important wood (a material rarely recovered) was for Mesolithic people. The findings challenge many of the preconceived views of this period in terms of the character and scale of activity and the degree of investment in a particular place in the landscape. Volume 1 focuses on an interpretation of the site, while volume 2 of Star Carr provides detail on specific areas of research. Readers may prefer to download and cite from the PDF version of this book. This has a specific DOI and has a fixed structure with page numbers. Guidance on citing from other ebook versions without stable page numbers (Kindle, EPUB etc.) is now usually offered within style guidance (e.g. by the MLA style guide, The Chicago Manual of Style etc.) so please check the information offered on this by the referencing style you use.